PANCHTHAR, Jan 4: Two goals after the break from substitute Saran Basnet gave host Phidim Sporting Club a 2-0 win over Fans Club (BRC) of Bhutan on Tuesday in the Eighth Falgunanda Gold Cup Football Tournament being held in Phidim, Panchthar. Second half substitute Saran netted in the 60th and 79th minutes to send Fans Club crashing out after the very first match and secure the home team a place in the semifinal stage. 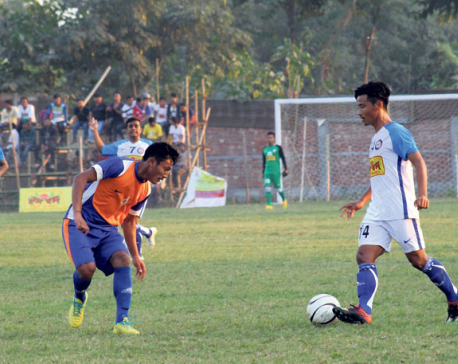 Phidim will take on tournament favorite Birtamod United of Jhapa XI in the semifinal to be played on Thursday. Fans of Bhutan which enjoyed bye in the first round, conceded the first goal due to defensive error. Saran opened scoring in a pass of Ashis Rai who collected the ball after Fans Club defender failed to control the ball. Saran doubled the advantage in the 79th minute in a cross of Sajan Rai who collected a long pass of Pradip Angdangbe before releasing it for the scorer. 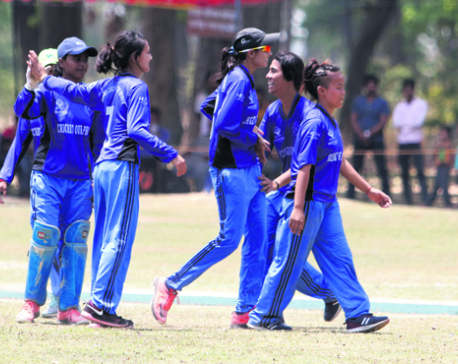 Karna Singh Sonam Memorial Club of Taplejung will take on Church Boys Club of Kathmandu in the next quarterfinal on Wednesday.